When it comes to travel planning we’re somehow always a little late to the game. Usually we realise that we should start planning our travel itinerary for the new year around mid December… And by then we’re actually already quite late – especially for the first half of the year! Where will our traces lead this year? So, we promise ourselves to get better, prepare and be more organised in the future. But that might be just another one of those New Year’s resolutions we’ll break soon enough 😉 When it comes to our Travel Bucket List, then we can only assure you – the more we travel, the longer this list grows. See the tiny boat on the horizon? If we weren’t afraid of the ocean a bit we could totally be sea nomads! 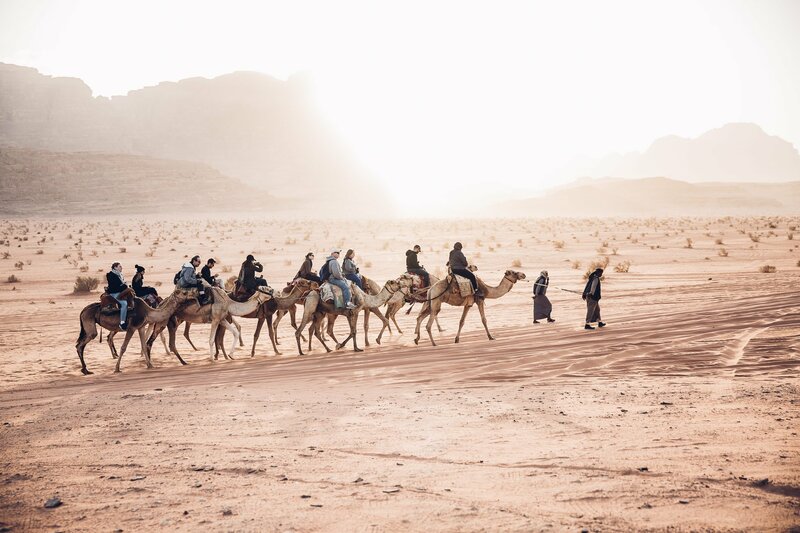 Yes, we went to Jordan this year, but we would totally come again! 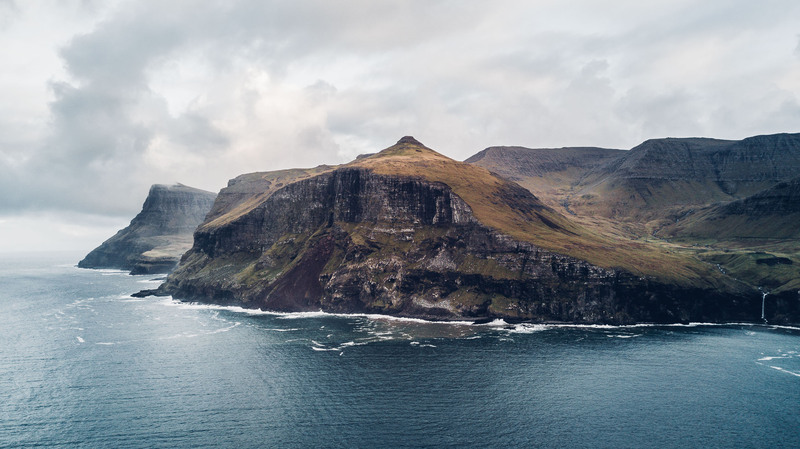 We definitely want to re-visit the Faroe Islands. Maybe when the mountains are covered in snow (and we maybe get to see Northern Lights!). We can’t believe that we didn’t visit these three continents since over 10 years! Most of our travels in recent years were focused on short haul destinations in Europe, Middle East or North Africa, and long-haul trips to North America, Central America and the Caribbean. That is about to change 2018! 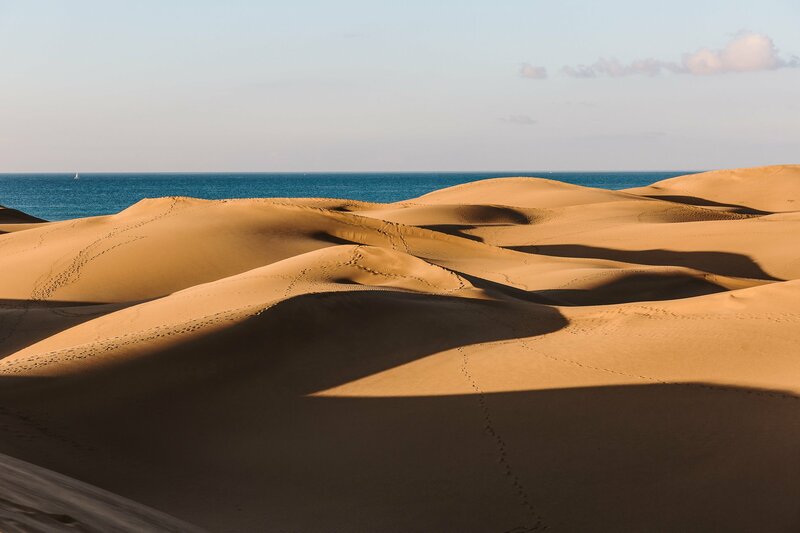 There are many reasons why Namibia made it to the Top of our Bucket List for 2018. Firstly: We have never been to Africa! Well, not really at least. We did set foot on the African continent by visiting Morocco and Egypt, but those aren’t really African countries, but Arab ones. The culture, the people, the landscapes – it doesn’t feel like Africa in the North. Secondly: Namibia has it all: Deserts, lush wildlife habitats, a wild coastline, canyons, mountains, plains – you name it! Sossusvlei has been a bucket list item for us for a while and spending our first morning in Namibia watching the dunes flush red in the light of the rising sun and laying the first trail of footprints on these ancient sands is an experience we will treasure for a long time to come. 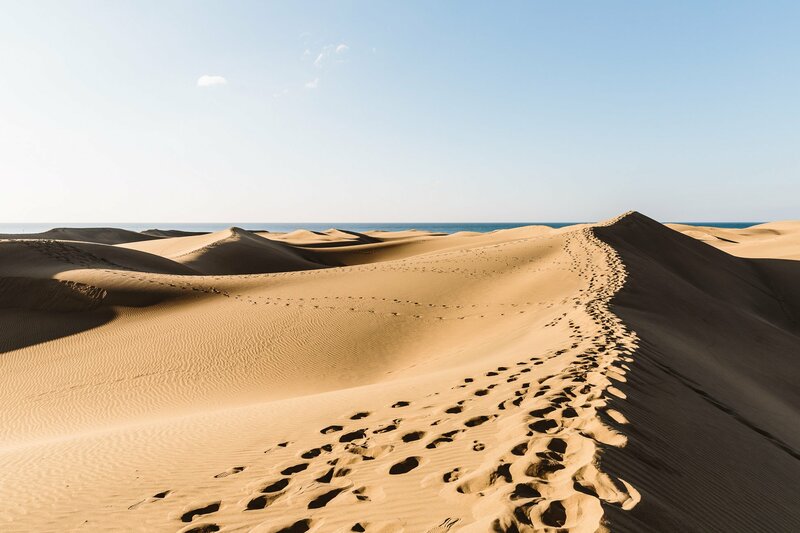 While we chose to sit, immersed in a peaceful silence we have only found in Namibia, these wanderers climbed the far slope, passing between shadow and sun cast by the shape of the dunes, their shadows stretching before them as they climbed ever higher. These amazing place completely blew us away. What’s your bucket list item that exceeded your highest expectations? What we want to experience in Namibia? What’s a trip to Southern Africa without spending some time amongst its iconic animals. All this week we will be sharing some of our favourite wildlife moments. First up is from our final night in Etosha National Park. We were rushing back to camp before the gates closed at sunset and we found dozens on giraffe, zebra, wildebeest and so many other antelope marching across the plains for a sunset drink. Who inspired us to go there? Freya and Chris – the couple running thesandyfeet.com and their incredible 11 day Namibia road trip itinerary. The best season to visit Namibia is usually the Dry Season between May and September. But we always prefer the off-season and therefore plan on visiting Namibia in April. This marks the end of the rainy season and Namibia can be lush and green in parts. This makes wildlife spotting harder, but also more rewarding! And prices are lower during this season as well. We have to share a secret with you: We haven’t been to Asia since 2005! Yes, you heard right – it’s been over 10 years (and we can’t believe this ourselves). In 2005 we visited Bangkok and Bali, both already very touristy destinations back then. Myanmar wasn’t on our radar in 2005 – but this changed a couple of years ago, yet we never managed to make it. The furthest East we went since 2005 was our trip to Azerbaijan in 2016 (see the blogpost here). Now this definitely has to change in 2018! And from all the Asian destinations Myanmar is on top of our Bucket List. The country offer a variety of landscapes, is still not overcrowded by visitors and we feel especially drawn to the Buddhist culture and philosophy. What we want to experience in Myanmar? Kathi and Romeo from sommertageblog.com and their recent 3 week trip through Myanmar starting in Yangon. The best season to visit Myanmar is between October and February. This is the dry season and the only time of the year where you can also include the beach destinations (like Ngapali) to your itinerary. Yet again we’ll go against the mainstream clock and plan on visiting Myanmar in September, right before the main season. Why? This marks the end of the rainy season, so Myanmar will be lush and green and not hot and dusty. And again: We always prefer the low season! Argentina holds a special place on this list. For a very personal reason. We have a family connection to Argentina as Marion’s grandfather was from Argentina. He worked for the United Nations and therefore left Argentina and moved around quite a bit (maybe that’s where the travel bug originated from). Marion’s Dad was born in Oslo during a short family stay in Norway, her first uncle was born in the USA and her second uncle was born – you guessed it – in Austria. That’s where Marion’s grandparents finally moved and settled. And that’s how Marion came into this world – and probably also got her grandfather’s nickname “Wienerin” (Viennese Girl). While Carlos never really gave up his Argentinian roots (think imported red wine and Asado all year long), Marion didn’t get a lot of connection to Argentina up until 2002 during the first visit. So while Marion got to visit Buenos Aires and her countless cousins in 2002, we have never been there together. Unfortunately 2002 was also the year of one of the biggest financial crisis’ in Argentina, which overshadowed the visit. Many members of Marion’s family lost their jobs and houses during that period. One of the reasons why it’s time to re-visit Argentina under different circumstances! What we want to experience in Argentina? The best season to visit Argentina is quite dependent on where in the country you want to go. Argentina is huge and there are many different regions (and climate zones) to discover. Since we want to also visit the South (Patagonia) we plan on visiting in November (which is before the main season that starts in December). If we want to see Orcas we might have to move the visit into the period between February and May though, as this is the main season for whale watching on the Valdes peninsula! This is still undecided. What’s on your Travel Bucket List 2018? Argentina is also in blucket list! I’m an Argentinean living in Vienna! I haven’t been there for a while (2 years). I can say November is the best option, there may be not be the orcas but the are austral whales in Peninsula de Valdez. Buenos Aires is dressed with the colors of Jacarandas and it is warm enough but not hot. If I have to choose I would go in November!